Quality and durability are combined to produce the LARGE BENCH FIXTURE. It is connected to the power unit with the black cord. The large BENCH FIXTURES (BF2045 and BF4060) performs the same operation as the BF1520. The one difference is in the marking area of the applicator which is 2' x 4-1/2' or 4" x 6" to accommodate much larger legend, such as trademarks on saw and knife blades, plumbing fixtures, stainless steel sinks, large bearings, etc. 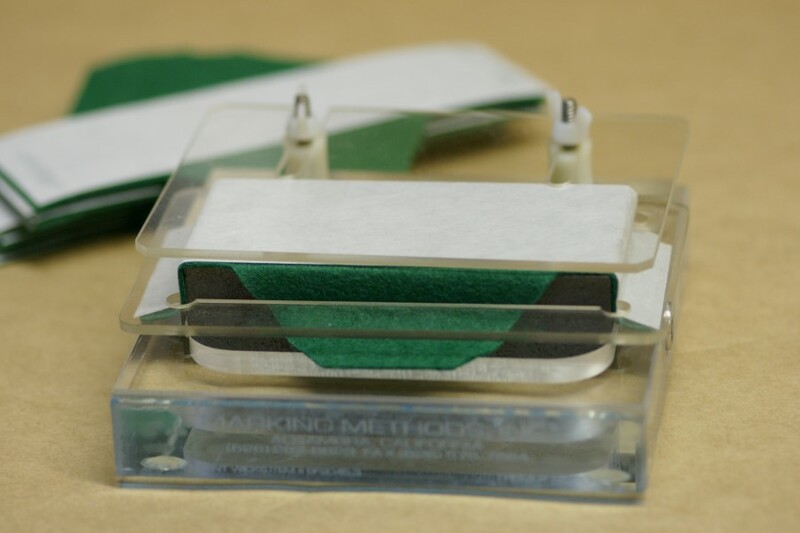 This Bench Fixture Assembly consists of a 2" x 4-1/2" marking surface, retainer ring, un-milled Plexiglas locating plate, and 11 replacement wicks.